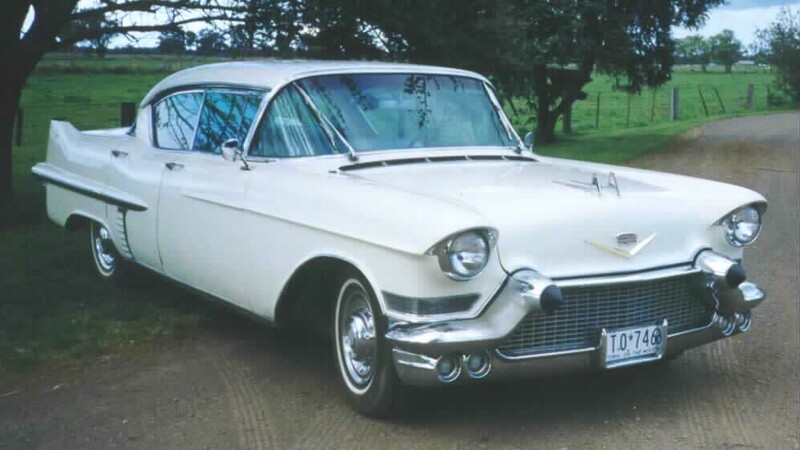 I�ve just purchased my first Cadillac, a left hand drive 1957 Sedan de Ville. I�ve been looking around for sometime now. A couple of years back at Echuca, I had a ride in Ralph Plarre�s 1957 convertible, also Alf Dichiera�s 1961 and Irwin Sinclair�s 1966 convertible. I went home very impressed and with plenty of ideas. Then a few weeks ago I passed a red 1955 on the road and in an instant I made up my mind and jumped on the phone. Joe from Golden Gasolines was pleased to point me in the right direction. He tracked down a 1957 Sedan de Ville LHD, in running condition and registered in South Australia. As Joe was recommended by Club members, I paid up and hoped for the best without seeing the car! I couldn�t insure it, no-one wanted to pick it up... too wide and too long, so I headed to Melbourne to collect it not even sure of what it was going to look like. I didn�t have to ask when I got to the depot... What a car! I jumped in unregistered, uninsured...oops! Too bad, I was a very happy Cadillac owner. On the way home, I had a half hour fuel stop as it took me 25 minutes to find the fuel cap! How the yanks decided to put it behind the tail light I don�t really want to know. I�m sure the guys at the servo though I had pinched it! Arrived home to Shepparton in one piece. No-one dared to complain about my driving... the smile on my face said it all. Hope to catch up at Echuca. Thanks again for everyone�s help.